Fleet Air Arm maintainers in the USA based at NAS Miramar. Images and commentary on the 1969 Trans-Atlantic Air Race and F4K USS Saratoga operations. A Sea Vixen having veered off the runway at RNAS Yeovilton (HMS Heron) circa 1964. Photo: HMS Heron Photographic section The Mk 1 Sea Vixen call sign 710 was at the time being operated by 766 Squadron (flying ice-cream cone) at Yeovilton. Returning from a sortie in bad weather the starboard main-wheel tyre aquaplaned on the flooded runway and burst. The observer of this aircraft was Lt Bill Hart who has kindly contacted me but is unsure of the aircraft serial number. It would be one of the following: XJ 492, XJ 517, XJ 564, XJ 570, XJ 588 or XN 700. If anybody knows more then please get in touch. These numbers and information on the cause of the accident have been provided by Bill Hart from his log. Lee Howard has since been in touch and informed me that the Sea Vixen in the picture is serial number XN 700 which was being driven (piloted) by Lt Cdr R McQueen at the time. What Bill Hart did not let on is that he was flying in the 'coal-hole' of Sea Vixen FAW.1 XN710 operating with 890 Squadron on Ark Royal, off Malaya, as 247/R when it suffered a fuel transfer problem. Whilst attempting a diversion to Tengah both engines flamed out so Bill and his pilot, Lt. D.J Dunbar-Dempsey, vacated the aircraft using Martin Baker's wonderful escape system, a.k.a. ejection seats. The Bill Hart concerned here, is not the Lt-Cdr W.H. Hart who was previously CO of 890 (witch on broomstick against a three-quarter moon) Squadron commissioned at Yeovilton on 1 February 1960. 890 then went on to operate from HMS Hermes and HMS Ark Royal as mentioned in: Birtles, Philip. (1986) 'De Havilland Vampire, Venom and Sea Vixen', Ian Allen Ltd. ISBN 0-7110-1566-X. Use the 'Sea Vixen 50' button, above left, for pictures and commentary of the only currently flying Sea Vixen, FAW 2 XP 924, taken at the 'Sea Vixen 50' re-union, RNAS Yeovilton (HMS Heron) on Saturday 29 September 2001. You will also find references to further reading on the Sea Vixen. Having spent some time with Sea Vixens and Hunters (more pictures), I later went on to serve with 892 Squadron operating F4K Phantoms from HMS Ark Royal. After 892 and Ark Royal I became involved with 'special fits' to Hunter GA11, PR10 (that one was interesting), Canberra T22, Sea Devon and Heron, Sea King, Wessex and Lynx. 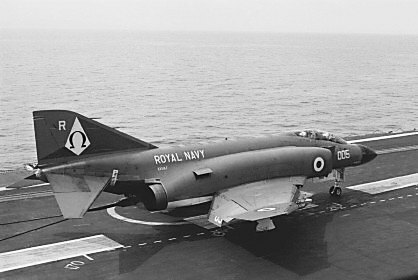 The wire can be seen still engaged in the aircraft's deck hook. Note the 892 Squadron emblem on the aircraft's fin. The Omega emblem symbolized the last conventional jet squadron to be commissioned into the FAA. The picture above is of a Phantom about to go round again for another approach attempt. This one is so high that it suggests a practice run. 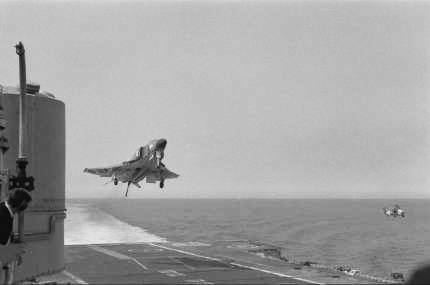 When aircraft missed a wire and had to blast off again the manoeuvre was called a 'bolter'. More pictures of Phantoms, and other military aircraft can be found on Jeremy Harkin's Military Aircraft Archive which is based in the USA. The UK aviation site formerly known as " THE HANGAR " changed to " Thunder & Lightnings " and has now moved to be a part of Damien Burke's Web Site.